The mission of San Diego Book Arts is to serve as an educational and creative resource for the community and to advance the book as a vital contemporary art form. San Diego Book Arts is open to everyone interested in the art of the book and serves as an educational and creative resource for the community. San Diego Book Arts was established by a group of book artists in 1996 following a presentation to the Artists Guild of the San Diego Museum of Art, and it was designated a 501(c)3 nonprofit in 1999. Membership has grown to over 150 people representing many different fields including artists, collectors, graphic designers, bookbinders, conservators, librarians, teachers, writers and printmakers. For its members, SDBA publishes a monthly newsletter with local and national book arts information, mounts exhibitions, and offers teaching opportunities. It also brings members together through meetings, potlucks, collaborative projects, and outreach activities. The organization is governed by a volunteer board of directors and managed by an executive director who oversees the activities of the various committees, which are chaired and staffed by volunteers. Committees include Membership, Workshops, Exhibitions, Outreach, Publications, Hospitality, Publicity and Development. Volunteers are the energy, vision, and commitment that have kept San Diego Book Arts running for 20 years. We are forever grateful for their contributions. 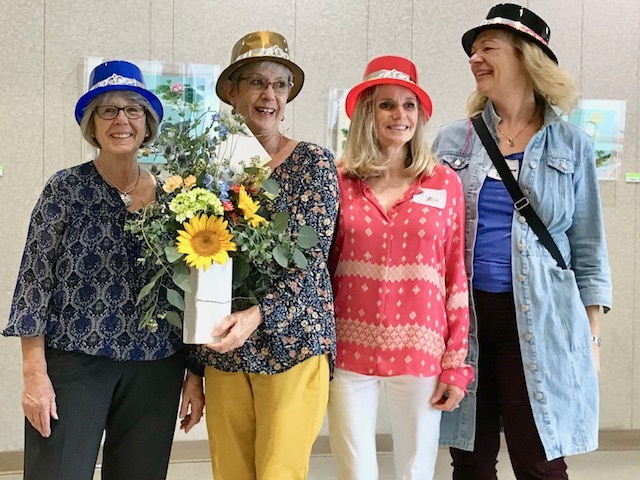 Linda Faulkner, Gretchen Hiegel, Janis Reeser, and Barbara Ruys at the November, 2017 potluck and volunteer appreciation. Hats off to the Board! Each year SDBA sponsors free public lectures, workshops given by internationally recognized book arts specialists, free community classes, and a Book Arts Basics curriculum of inexpensive 3-hour classes. As a member, you receive advance notice of the lectures, a discount on the price of workshops, and the opportunity to teach community and Book Arts Basics classes. These activities offer ways to interact with other book artists, develop your book arts skills, and share your knowledge with others. SDBA has been fortunate in receiving enthusiastic support and recognition from local and national institutions, including the University of California San Diego, the Athenaeum Music & Arts Library in La Jolla, San Diego State University, the San Diego Public Library, the Japanese Friendship Garden in Balboa Park, The Women's Museum of California, Francis Parker School, and the Durango Arts Center in Colorado. This generous cooperation has enabled SDBA to present a number of quality exhibitions over the years. As a member you may participate in the SDBA annual exhibition as well as other SDBA-sponsored exhibitions at both public venues and private galleries.